As we read of the furore regarding Judge Brett Kavanaugh over in Washington and his alleged behaviour towards women, the broad picture remains and once again spikes: women are treated to a different standard. In Spain, relieved, we see that we live in ‘the fifth country in the world where women feel the safest’ (behind Iceland, Norway, Switzerland and Slovenia), but even so, we have had 58 women killed by their companions so far this year in Spain. The #MeToo movement, the heart of the new feminist wave that focuses on sexual violence, has called for a general strike across Spain for the International Women’s Day on March 8th 2019 (following their successful protest last year). Spain is nevertheless moving forward rapidly in women’s rights. We read ‘Spain’s Supreme Court has ruled that any and all physical contact of a sexual nature, where deliberate, and irrespective of how brief it is, counts as a criminal offence. This ground-breaking and necessary verdict means grabbing someone's bottom, breast or legs in a pub, a crowd or on public transport, for example, is no longer simply a tort or civil offence but attracts criminal charges on the grounds of 'sexual abuse'...’ (Eye on Spain here). We also read of a specific case here, as ‘a man is sentenced to a year in prison for touching a woman on the bottom’ outside a bar in Almería. Spain then, is moving forward in its respect towards las españolas. This is a worthy thing. From A Place in the Sun: ‘Overseas Property & the Countdown to Brexit’. The article talks of ‘soaring interest from Britons’ in property in Spain. The report here. Tourism, are we making money yet? ‘The paradox of Spanish tourism: richer regions with poorer inhabitants’. An article at El Confidencial here. The article begins in the Balearics before addressing the rest of Spain: ‘Twenty years ago, the inhabitants of the Balearic Islands were the third richest in Spain, behind only Madrid and Navarra. The islands received almost 10 million tourists, a figure that has increased since the early nineties. But from the year 2000, per capita income began to fall with respect to that of Spain: in 2001, the Balearic Islands occupied the fifth position; in 2007, the sixth, and now it is the seventh. It is surpassed by Aragon, Catalonia, Madrid, Navarra, the Basque Country and La Rioja. At the same time, tourist arrivals have not stopped growing: 2018 will be, due to the decline throughout the country, the first in which tourism has stagnated since 2012...’. Tourism is falling, says El Blog Salmón. Seven graphics explain why here. There is an important European Union development in the works affecting, inter alia, those non EU citizens who will wish to visit any Schengen member country as from mid-2021. The rules seem quite complex and compliance may be difficult despite the mild assurances included in the information currently available, especially if travellers wish to visit more than one EU country (Thanks Chuck). Schengen Visa Information here. ‘The Minister of Finance, María Jesús Montero, decides to set a 3% tax on operations in Spain by large technology platforms. This is the so-called 'digital tax' to tax companies that sell data, online advertising services or brokerage, which includes Airbnb or Uber. The European Commission is proposing to levy this percentage on major global platforms with a worldwide turnover of more than €750 million...’. More at El Mundo here. ‘It was clear that with Pablo Casado's victory in the Popular Party primaries, the most conservative ideas returned to the leading party of the right and that it wouldn’t be long before we saw the party move even further right’, says Público here. ‘...His tone during the campaign, appealing to an unbridled Spanish nationalist discourse, his mocking of the victims of Francoism or his vindication of figures like Fraga or Aznar, were already anticipating what we have been seeing since then...’. The news-site gives us ten examples. From eldiario.es comes an article about the influence of Steve Bannon on the parties of the extreme right in Europe. A quote: ‘“There are many people ... who are not far from our convictions, such as Pablo Casado in Spain”, said Steve Bannon's partner in Brussels, Mischaël Modrikamen’. But, Bannon might prefer Spain’s far-right Vox party which had a successful meeting this week with 10,000 supporters in Madrid’s Palacio de Vistalegre. The party leader is Santiago Abascal. El Huff Post reports on the phenomenon here. ‘Casado avoids a head-on collision with Vox: "We share a lot of ideas" said Pablo Casado after the demonstration of strength last Sunday in Vistalegre’. The report at VozPópuli here. Who are the Vox leaders? eldiario.es introduces them here. Susana Díaz has announced Andalusian elections for December 2nd. The PP-A has come up with a clever wheeze – it is launching its campaign outside the doors of a brothel in Seville, made famous by the scandal of the PSOE-A poobahs who spent public money (some 15,000€) there im merry bacchanalias. An article about Mario Blancke comes from El Plural: ‘The 'Manuel Valls' of the South, a Belgian and Ciudadanos mayor. The leader of Alcaucín (Málaga), near the village where Albert Rivera's mother was born, is known as 'El Guiri'’. The article says ‘...Blancke came to politics collaterally thanks to his activism in defence of the legalization of irregular housing in the area where numerous foreigners live in that beautiful area...’. Would Blancke, who is supported by the Save Our Homes (SOHA), be affected (as an example) by the presumptive loss of British votes? Without doubt. From La Sexta TV: ‘The president of the Catalan PP, Xavier García Albiol, has announced that he will leave his seat in Parliament and that the party will hold an extraordinary congress to replace him at the head of the party in Catalonia, where he officially arrived in March 2017...’. The PP won just three seats in the last regional elections in Catalonia. ‘Pedro Sánchez is winning on Catalonia — but his approach is risky and could lead to a snap election. The Spanish prime minister’s decision to take a softer stance toward Catalan separatists than his predecessor has accentuated the divisions among independence leaders in the region whose lack of cohesion was on display this week as they celebrated the anniversary of last year’s outlawed referendum...’. From Politico (in English) here. The same site here writes an editorial which is titled: ‘Catalonian independence is not a threat to Europe. Comparing the pro-independence movement to populism and nationalism is very wide of the mark’. One news-source which is irate about Madrid’s handling of Catalonia is OKDiario, furious that this past Saturday’s Informe Semanal (RTVE news magazine) should broadcast an interview with ‘the imprisoned coup-plotter Oriol Junqueras’. The Cervantes Institute returns to Gibraltar. The centre, which closed in 2015 (‘everyone except the apes speak Spanish in Gibraltar’ said García Margallo at the time), reopens to teach Spanish amid the UK's exit from the EU. The institution also opens new offices in Washington and Los Angeles. Story at El País here. ‘Following Brexit, Who's a Resident?’ From Lenox Napier blog here. EuroCitizens 2000 has a report following a meeting with British embassy officials and Robin Walker, the Undersecretary of State for the Department for Exiting the European Union (Wiki). ‘No more glib assurances’ says DExEU minister Robin Walker after meeting Citizens’ Rights campaigners in Madrid’. The article includes ‘...Whilst the Withdrawal Agreement does not cover political rights, which are the competence of member states, Robin Walker gave some very positive news regarding Spain. He said that discussions between the two governments about future bilateral arrangements on political rights, enabling Spaniards in the UK and Britons in Spain to stand and vote in local elections, are at an advanced stage and should be concluded soon...’. The Parliament Magazine however writes of ‘EU member states under fire over expat voting restrictions’ here. A quote from The Diplomat in Spain (here) ‘...Given that, by then, the British will have lost European citizenship, the current 37 councillors of British nationality who exist in Spain (43.5% of foreigners elected in 2015) will lose the right to run for re-election...’. Brits residing in Spain are all, what...? The London School of Economics says ‘Let’s ditch the stereotypes about Britons who live in the EU’. An interesting article here. An excerpt: ‘...We have been frustrated with every news report about what Brexit means for British citizens living in the EU27, because even pieces by commentators most sympathetic to this group find themselves reproducing unhelpful stereotypes as the editors insist on attention-grabbing headlines, and as the images selected evoke ideas that the British in Europe are all older pensioners who remain painfully patriotic, and spend all their time in bars. In documenting how British populations living abroad are represented in the UK parliament, we have registered how these stereotypes have also permeated the discourse and narratives of political agents...’. From El Mundo here: ‘British residents, fed up with the uncertainty of 'Brexit'. The article notes that ‘...The 29 March 2019 is the deadline to set the roadmap of the Brexit and although many British residents ... reject it, the majority is looking forward to that date to clear the uncertainties in which they were plunged following the result of the referendum voted on July 25, 2016...’. ‘A large Social Security fraud has been uncovered at 600 Low Cost Peluqueros, a hairdressers' Network. Employees were working in Low Cost Peluqueros with working days of up to 12 hours, for just 480€ per month’. 20 Minutos says that 37 people have been arrested in Seville. BoT’s last two editorials summed up as one at Zona Crítica here. The top five Spanish newspapers in August daily print runs, according to the OJD: El País 116,808; Marca 116,003; As 101,491; La Vanguardia 88,702 and El Mundo 87,558. Two of these giants only have sports news! For positive news from Spain, go to the Government-controlled Marca España here. El Español shows how they trick the shopper in the supermarket with ‘Ten misleading labels’ here. ‘...The Council of Ministers has taken a step this Friday to eliminate the "regulatory barriers" that, so far, "have hindered and discouraged the implementation of self-consumption of electricity in Spain. The Government recognises the right of citizens to consume electricity themselves without tolls or charges. In short, 'the sun tax' has finally been repealed...’. El Independiente has the story here. ‘What you need to know about Spain's new petrol pump labels’, says The Local here. ‘Fines for cars in Madrid not showing 'emissions stickers'. Drivers in Madrid without traffic authority emissions stickers in a prominent place will be fined in six months' time, warns the city council. Although residents will now have time to acquire their stickers, issued by the General Directorate of Traffic (DGT) from the post office, where this leaves visitors to the city is unclear. Hire cars will already have them in place by the time the six months is up, but people from other parts of Spain spending the weekend in Madrid will have to be careful...’. Story at Think Spain here. More on Madrid traffic rules from El País in English here. The reason for all this: ‘New figures deal fresh blow to Spain’s fight against air pollution. Data from 2017 released by the government show slight spike in nitrogen dioxide and particulate matter’ (El País in English here). ‘Spain is the least densely populated country in Southern Europe, with only 5% of the population living in 53% of the land area. Some parts are as unpopulated as Lapland’. Item, with map (and comments), at Reddit here. El Mundo: ‘The Government publishes the salaries of mayors: from 102,000 euros in Madrid to 3,381 in Horcajo de Santiago’. The list of all the town halls of Spain and their remuneration to their mayors. The title itself is misleading, since several mayors (including the Madrid one) give part of their earnings to charity, and a number of other mayors, of smaller municipalities, are not paid anything beyond their expenses. The story here. ‘Nurses will soon be able to prescribe medicines without the need to be authorized by a doctor. The government of Pedro Sánchez is finalizing the draft of the royal decree that will end a historic demand from the sector and has required the work of two governments and four health ministers...’. Item at 20 Minutos here. ‘An Andalusian firm has built the first passenger capsule for the highly-anticipated Hyperloop rapid transport system. Airtificial, based in Cádiz, reached the global milestone in a project with California-based Hyperloop Transportation Technologies, and believes it will create wealth across Spain...’. From The Olive Press here. A video piece on the Hyperloop here. Spain is a country of castles and walls and a good number of these have survived to this day in very good condition. Much of what is preserved from the medieval era, remains in towns, whose streets have maintained their personality, without succumbing to the temptation to expand with modern buildings and complexes. Walking through these villages is like immersing yourself in a fairy tale. Its narrow streets, walls and castles transport us to a time of legend. If you want to make a trip to the Spanish Middle Ages, why not start with these....according to the Repsol Guide, they are the 10 best-preserved medieval villages in Spain...’. Item from Eye on Spain here. ‘Into Spain and on to Santiago de Compostela’ with Mike Arbus here. Molly from Piccavey in Almería City here. It looks like the new version of Gmail we have been saddled with went and moved last week’s BoT into the ‘spam’ listings. I’ve written to gmailers to warn them. So far, around twenty subscribers were inconvenienced. Thanks Google! 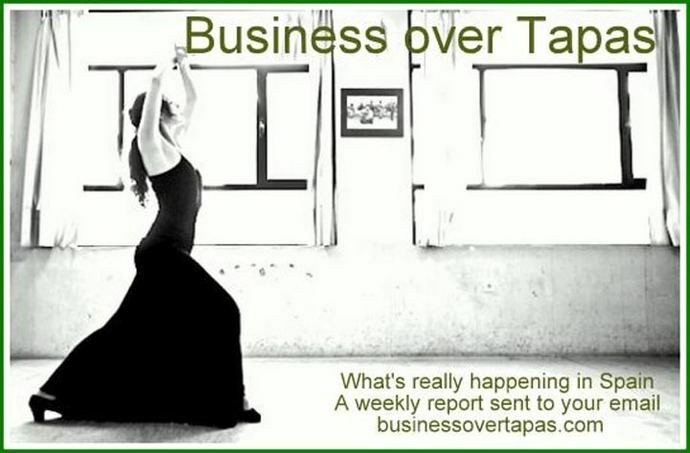 If it remains an issue, I can transfer your email from my lenox@businessovertapas.com account to my gmail address. Thanks again for regularly sending me your interesting and useful letter. I appreciate that very much.